Let's be honest, the kids can walk to school. Race car = more important. The National Auto Sport Association announced its new NASA Prototype series today, hoping to bring prototype sportscar racing to the masses. For $65,000, you can get an all-inclusive kit for the 1,500-lb Elan NP01 prototype racer. Each kit includes the steel tube frame chassis, be-winged and be-finned fiberglass composite body, six-speed sequential F3 gearbox, wheels with Toyo Proxes RR tires, and 185-horsepower 2.0-liter Mazdaspeed MZR engine. "Just add safety belts, fluids and fuel," brags the brochure. Safety, affordability and reliability were major factors that went into the design. Using an existing Mazda engine that isn't too high-strung should make the cars easy to work on and fairly reliable. The tube-frame design features an integrated roll cage, too, which was designed to fit even taller drivers and has additional bars to guard against side impacts. Many similar sportscars like the Spec Racer Ford and Sports 2000 are open-cockpit, so seeing an amateur-oriented closed-cockpit prototype design is a welcome option and a breath of fresh air. NASA decided to offer these as a kit because racers were going to take every piece of these apart anyway before they ever hit a race track. Sending a kit instead of a finished car saves everyone a lot of unnecessary work, although NASA will sell you a completed car if you want. 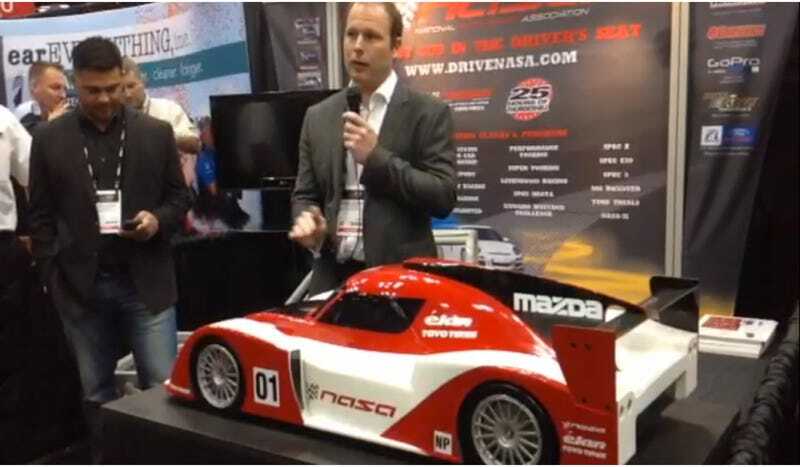 NASA plans to start its NASA Prototype Championship Series in 2016, which is a spec series designed for the new cars. Cars are available for purchase on NASA's website dedicated to the new series. Considering the millions that Le Mans teams spend on prototype racers, $65K is the bargain of the century.